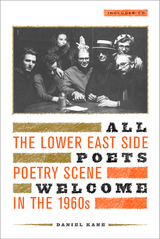 This landmark book, together with its accompanying CD, captures the heady excitement of the vibrant, irreverent poetry scene of New York's Lower East Side in the 1960s. Drawing from personal interviews with many of the participants, from unpublished letters, and from rare sound recordings, Daniel Kane brings together for the first time the people, political events, and poetic roots that coalesced into a highly influential community. From the poetry-reading venues of the early sixties, such as those at the Les Deux Mégots and Le Metro coffeehouses to The Poetry Project at St. Mark's Church, a vital forum for poets to this day, Kane traces the history of this literary renaissance, showing how it was born from a culture of publicly performed poetry. The Lower East Side in the sixties proved foundational in American verse culture, a defining era for the artistic and political avant-garde. The voices and works of John Ashbery, Amiri Baraka, Charles Bernstein, Bill Berkson, Ted Berrigan, Kenneth Koch, Bernadette Mayer, Ron Padgett, Denise Levertov, Paul Blackburn, Frank O'Hara, and many others enliven these pages, and the thirty five-track CD includes recordings of several of the poets reading from their work in the sixties and seventies. The Lower East Side's cafes, coffeehouses, and salons brought together poets of various aesthetic sensibilities, including writers associated with the so-called New York School, Beats, Black Mountain, Deep Image, San Francisco Renaissance, Umbra, and others. Kane shows that the significance for literary history of this loosely defined community of poets and artists lies in part in its reclaiming an orally centered poetic tradition, adapted specifically to open up the possibilities for an aesthetically daring, playful poetics and a politics of joy and resistance. Daniel Kane is Lecturer in the School of English and American Studies at the University of East Anglia in Norwich, England. He has had poems, interviews, and essays published in Exquisite Corpse, The Denver Quarterly, TriQuarterly, The Hat, and other publications. Epilogue: Bob Holman, the Poetry Project, and the Nuyorican Poets Cafe: "I Learned That Poetry Could Be about Community Here"